Are you looking for a way to highlight a product or business? 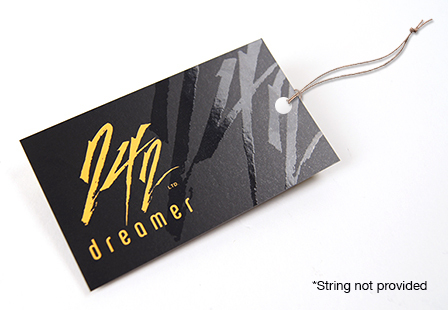 Leave a lasting impression with our Spot UV hang tag. With a custom hang tag, you can include a tagline, logo, website, social media icons, contact information and so much more. Spot Gloss enable you to create contrast and highlight specific areas of your hang tag; design patterns, photos, text, or logo. Choose from a variety of options and sizes that best fits your needs. Great for clothing, gift baskets, party favors, jewelry, specialty jars and more. String not provided. 1/8" diameter hole. Please Select 1.5" x 3.5" 1.75" x 3.5" 2" x 2" 2" x 3.5" 2" x 4" 2" x 6" 2.5" x 2.5" 3" x 3" 3.5" x 3.5"